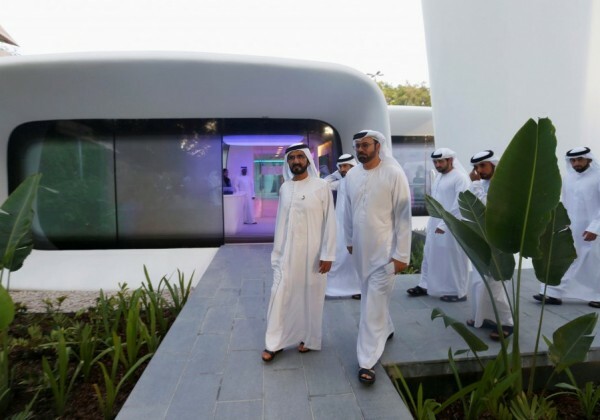 Mohammed inaugurates world’s first 3D-printed office in Dubai. His Highness Sheikh Mohammed bin Rashid Al Maktoum, Vice-President and Prime Minister of the UAE and Ruler of Dubai, stated that the UAE has emerged as one of the major incubators of innovation and future technology in the world today, and its focused initiatives to shape the future have become global models that can be emulated in all sectors. "We implement what we plan, and we pursue actions not theories. 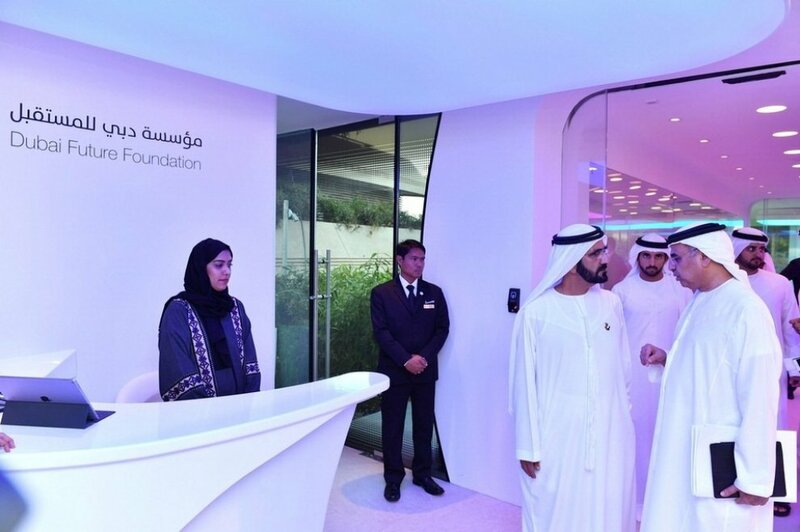 The rapidly changing world requires us to accelerate our pace of development, for history does not recognize our plans but our achievements," His Highness Sheikh Mohammed said while the opening of the ‘Office of the Future’, the first 3D-printed office in the world. The unique building on the Emirates Towers premises will house the temporary office of the Dubai Future Foundation. Present were Sheikh Hamdan bin Mohammed bin Rashid Al Maktoum, Crown Prince of Dubai, Sheikh Maktoum bin Mohammed bin Rashid Al Maktoum, Deputy Ruler of Dubai and Sheikh Ahmed bin Mohammed bin Rashid Al Maktoum, Chairman of Mohammed bin Rashid Al Maktoum Foundation His Highness stated: "We announce today the opening of the first 3D-printed office in the world, after less than a month of launching Dubai 3D printing strategy which showcases a modern model of construction. This is an experience we present to the world on implementing future technology in our lives, and it represents a new milestone for the UAE as a global leader in strategic achievements." He added: "We see this project as a case study that will benefit regulators as well as research and development centres at the regional and international levels on real application of 3-D printing technology. We are documenting this experience and building on it to take advantage of the most important lessons, which will serve as reference points to take this technology to new levels." 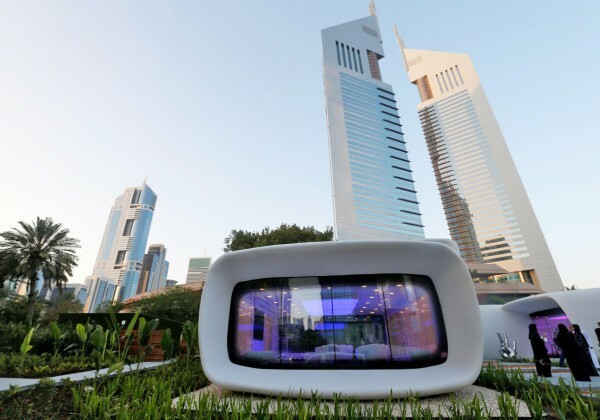 His Highness Sheikh Mohammed pointed out that the competitive advantages of 3-D printing in terms of lower costsand faster delivery will make the UAE one of the most important sustainable economic hubs, enabling the effective use of this technology to establish future cities in all sectors. 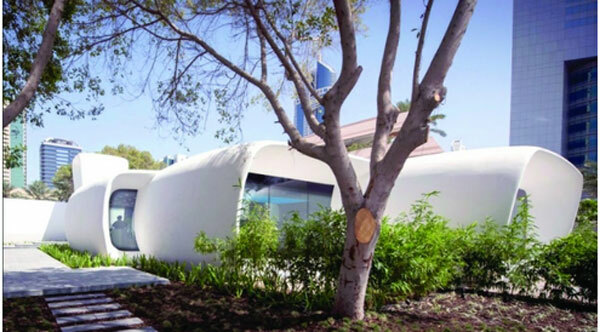 Universal innovative design and competitive cost The first 3D-printed office building of its kind in the world prepared for actual use has taken into account the integration of a unique building design and 3D-printing technology to offer key services within the building, such as electricity, water, telecommunications and air-conditioning. The office space covers up to 250 square metres, while the exterior design reflects the most innovative forms of future work place. 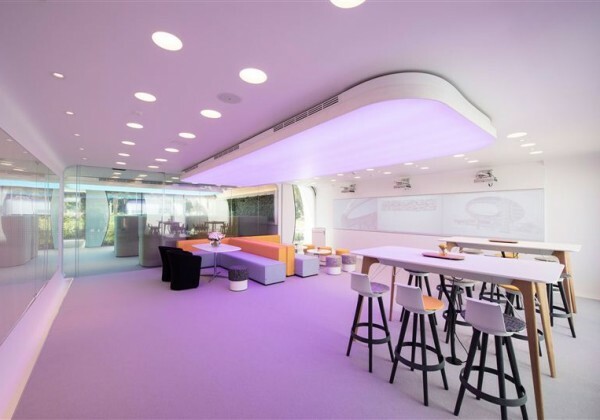 The design has been conceived to achieve a shift from the traditional form of work environments and provide greater opportunities to stimulate innovation and communication between work place teams. 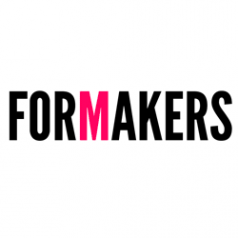 It also offers the possibilities for joint work with experts and innovators from around the world, and a platform to inspire ideas and develop relations between employees by establishing new methods for brainstorming sessions and creating a healthy and happy environment. The design also offers space for exhibitions and workshops as well as other events. 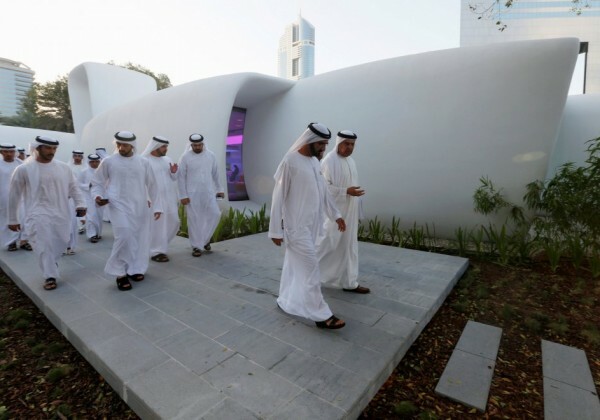 The 3D-printed office was constructed using a special mixture of cement and a set of building material designed and made in the UAE and the United States. These materials have undergone a range of tests in both China and the United Kingdom to ensure their reliability. An arc shape was adopted for the building for safety purposes and to ensure the stability of the building. Innovative features have been adopted in the office building to reduce energy consumption such as window shades to offer protection from direct sunlight and keep the building cool. Latest technology has been used in the management of information systems within the building. A 3D-printer measuring 20 feet high, 120 feet long and 40 feet wide was used to print the building. The printer features an automated robotic arm to implement printing process. The labour involved in the printing process included one staff to monitor the function of the printer, in addition to a group of seven people to install the building components on site as well as a team of 10 electricians and specialists to take care of the mechanical and electrical engineering. As a result, the labour cost was cut by more than 50% compared to conventional buildings of similar size. In order to manage the execution of the project, additional mobile printers were located at the construction site, in addition to the use of advanced computers to help ensure quality control, facilitate the printing processes, and form effective and productive basement for different projects requirements. The full model took only 17 days to print after which the internal and external designs were adopted. 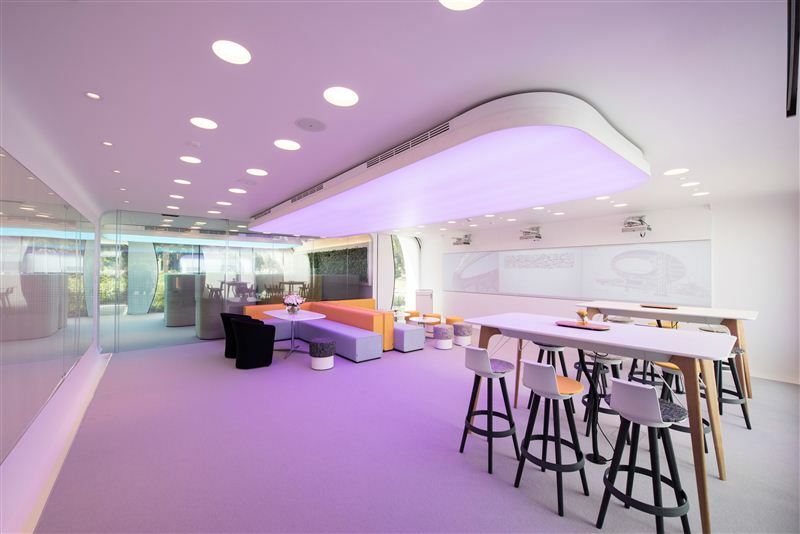 The office was installed on site within two days, which is significantly faster than traditional construction methods involving A category office buildings in such an innovative project. 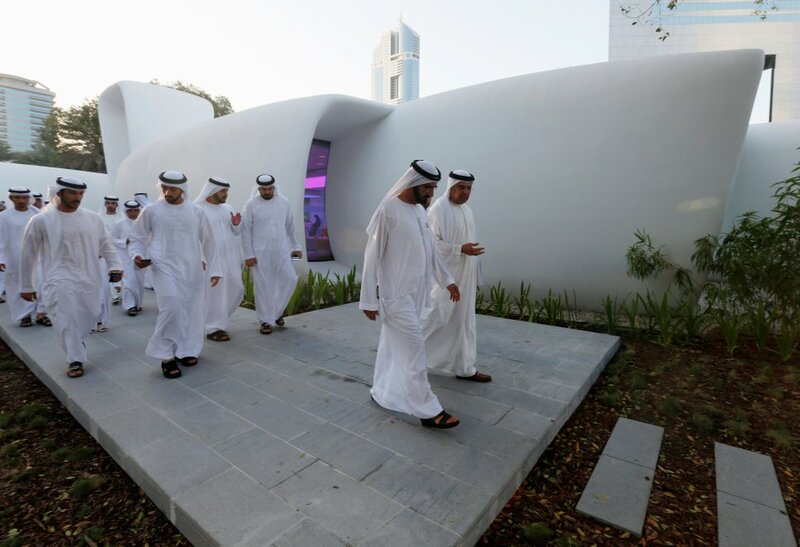 The 3D-printed office was constructed using a special mixture of cement and a set of building material designed and made in the UAE and the United States. These materials have undergone a range of tests in both China and the United Kingdom to ensure their reliability. 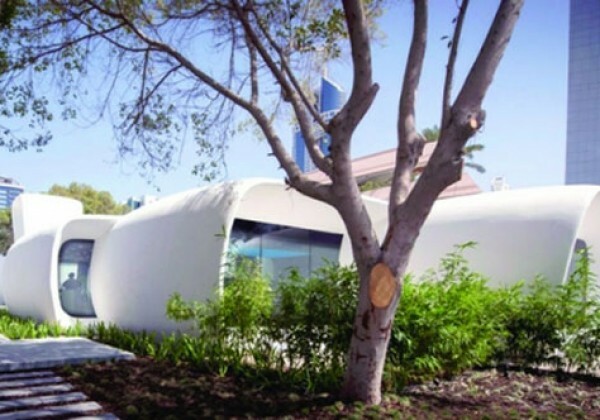 An arc shape was adopted for the building for safety purposes and to ensure the stability of the building. Innovative features have been adopted in the office building to reduce energy consumption such as window shades to offer protection from direct sunlight and keep the building cool. Latest technology has been used in the management of information systems within the building. A 3D-printer measuring 20 feet high, 120 feet long and 40 feet wide was used to print the building. The printer features an automated robotic arm to implement printing process. The labour involved in the printing process included one staff to monitor the function of the printer, in addition to a group of seven people to install the building components on site as well as a team of 10 electricians and specialists to take care of the mechanical and electrical engineering. As a result, the labour cost was cut by more than 50% compared to conventional buildings of similar size. All pictures: Courtesy Al Bayan].